Boston Marathon Bomber's Friend Sentenced To 6 Years In Prison : The Two-Way Dias Kadyrbayev went to college with Dzhokhar Tsarnaev. He pleaded guilty to obstruction of justice for getting rid of a computer and fireworks in Tsarnaev's room. 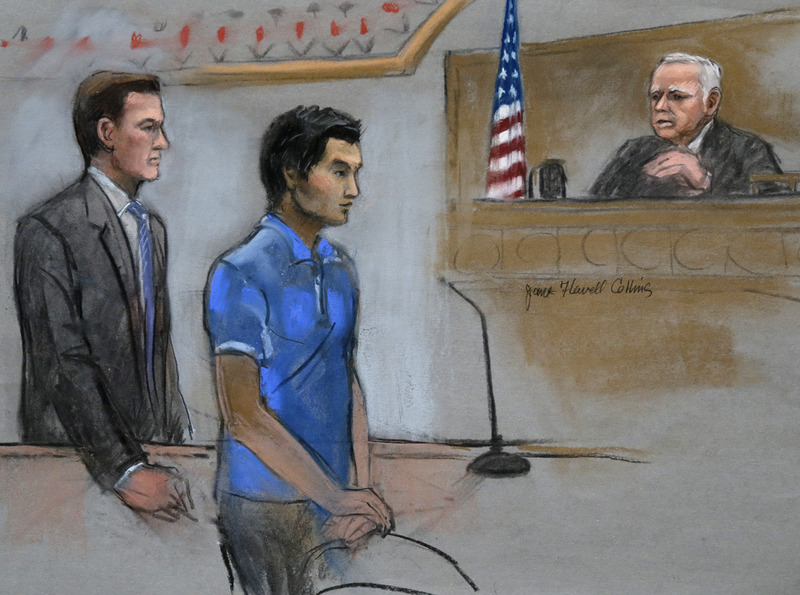 Dias Kadyrbayev, a college friend of Boston Marathon bombing suspect Dzhokhar Tsarnaev, is depicted in a court room sketch. A college friend of Boston Marathon bomber Dzhokhar Tsarnaev has been sentenced to 6 years in prison after he pleaded guilty to obstruction of justice. Dias Kadyrbayev admitted to going into Tsarnaev's room, picking up backpack containing a laptop and the remnants of some fireworks and then throwing them out in a garbage dumpster. "Kadyrbayev said Tuesday that he had no explanation for his actions. "'I can't find an answer. I really can't believe that I acted so stupidly,' he told Judge Douglas Woodlock before his sentence was imposed. "Kadyrbayev had faced up to seven years in prison. His lawyer had sought a three-year sentence. He will get credit for the 26 months he's been in custody and will be deported to his native Kazakhstan when his prison term is up. "In sentencing memos filed in court, prosecutors said Kadyrbayev had the power to help law enforcement identify Tsarnaev and prevent additional violence, possibly including the murder of Massachusetts Institute of Technology police Officer Sean Collier, who was killed by the Tsarnaev brothers as they tried to flee after the FBI released their photos. Dzhokhar's older brother, Tamerlan, died after a shootout with police." Kadyrbayev, if you remember, sent a text message to Tsarnaev after seeing his picture on the news. According to police, he told Tsarnaev that he looked like the Boston marathon bomber. Tsarnaev replied that he should come to his room and "take whatever you want."